Cockroach Traps called Hoy Hoy are well known and widely used. 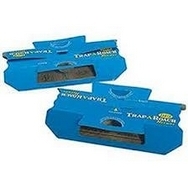 These roach traps are widely used in commercial and business kitchens where disease spreading oriental cockroaches can be a problem. Use these Hoy Hoy Cockroach Traps to detect exactly where the cockroaches are living and breeding. Then each glue board trap will kill and get rid of cockroaches where the traps are in place.